It’s the most important day of your life and all eyes will be on you, so you’ll want to make sure that you look your absolute best, not only on the day but also in the photographs. Whatever style of wedding you’re planning, I can provide a range of services to make sure you look simply stunning; from creating a camera-ready make-up through to advice on the colours and styles of wedding gowns, hairstyles and accessories. Fee: £225 weekday, £235 Saturday. A consultation for other members of the bridal party can help make them feel involved and appreciated as well as ensuring that everyone looks their best on the day. If this is of interest, please contact me to discuss your requirements so that I can tailor a package for you. I can also take you shopping to find your perfect wedding outfit, whether that’s a traditional, romantic “white” gown or something more elegant and sophisticated for the more mature bride. It’s really important to get your wedding make-up right. What looks good “in the flesh” can sometimes disappoint afterwards when you see the photographs. Together we’ll plan a flattering, long-lasting make-up which will not only enhance your natural colouring and make you look radiant throughout the day but also look great on film. I’ll give you full instructions so that you can recreate the look yourself not only for your wedding but also other special occasions or, if you like, I can be on hand to apply your make-up on the actual day. I will come to your home/wedding venue to apply the make-up we devised at your make-up tutorial and, should you wish, that of other members of the bridal party too. 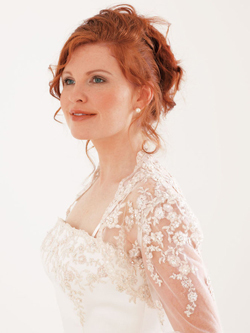 Fee: From £75 for the bride plus £50 for each additional person. There is always heavy demand for the wedding day make-up service, so do please do contact me as soon as possible so that I can reserve a date for you. A Bridal Services gift voucher from My Personal Style makes a wonderful engagement present.